Show off project data with a whole new set of customizable reports. Talk to your team without leaving Project by using built-in Lync features. 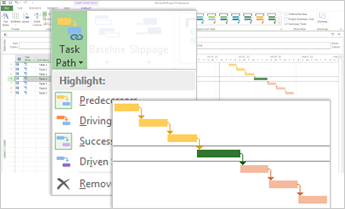 Trace task paths to untangle a messy Gantt Chart. If you’re ready to jump right into a project, see The project management road map. Instead of dropping you in a blank file, Project 2013 takes you to a one-stop center for starting your project. 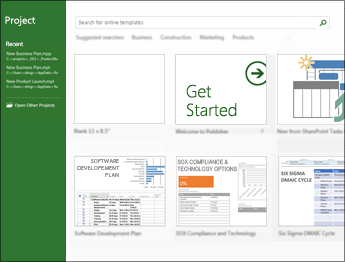 Browse the premade templates, import info from Excel or a SharePoint site, or just click Blank Project to get a clean Gantt Chart. You can open previous projects from your computer or OneDrive from there, too. With Project 2013, you can create crisp, colorful, professional reports without having to export your data to another program. Add pictures, charts, animation, links, and more — everything you need to clearly and effectively share project status info with your stakeholders and team members. To learn how to use the new reporting features, see Create a project report. An entirely new set of pre-installed reports takes full advantage of the new graphics and formatting capabilities. The walls of data are gone, replaced by vivid charts and images that better tell your project’s story at a glance. You can add or remove whatever elements you want to these reports. You can even change the colors! 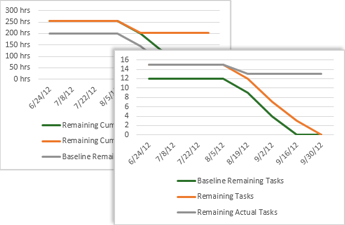 Burndown reports show planned work, completed work, and remaining work as lines on a graph. 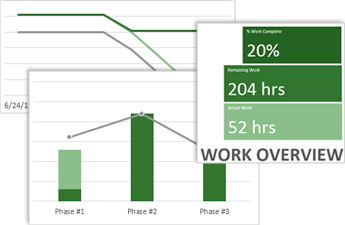 They give you and your stakeholders an at-a-glance status, letting you know if your project is behind schedule. Or ahead of it. Now you can create vibrant burndown reports in Project — no need to export your data! To learn how, see Create a burndown report. Project 2013 helps you stay in touch with your team members. Get progress updates, ask quick questions, or even have long-term strategy discussions, all without leaving Project. Just hover over a name and start an IM session, a video chat, an email, or even a phone call. You need to have Lync 2010 or later installed to take advantage of this feature. With a complex project, your Gantt Chart can start to look like a tangled knot of bars and link lines. To help sort this out, you can highlight the link chain — or task path — for any task. When you click a task, all of its predecessor tasks show up in one color and all of its successor tasks show up in another color. To find out how to turn on task paths, see Trace task links. With Project 2013, you can set task and project dates up to 12/31/2149. That’s a whole century longer than before! If you export Project reports, timelines, or data to other Office programs, you can take advantage of this new sharing feature. Join online meetings and share your PowerPoint slides, Word documents, Excel spreadsheets, and OneNote notes from any supported device, even if Office isn’t installed. The cloud is like file storage in the sky. You can get to it anytime you’re online. Now it’s easy to save your Office files to your own OneDrive or to your organization’s site. From there you can access and share your Project schedules, Excel spreadsheets, and other Office files. If you have Project Online, you can access a full version of Project from almost anywhere, even on PCs that don’t have Project 2013 installed. All you need is an internet connection and a PC running Windows 7 (or later). You’ll always have the latest version because updates are automatic.